Dr. Feelgood – But Is It Any Good? WHAT’S IT ALL ABOUT: First album with a new guitarist shakes some of the rust off of the band, but it’s still not as vital as their early work. 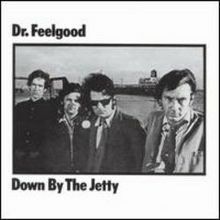 SOME WORDS, PHRASES AND CLAUSES ABOUT THIS RECORD: The first track, a perfunctory cover of “Ninety Nine and a Half (Won’t Do)” gave me pause that this Dr. Feelgood album would be the end of the road for my reviews of them. But then as more originals and obscure covers followed it showed that the change in guitarist somewhat energized the band. Gypie Mayo is no Wilko Johnson, but the band seemed game for adding his guitar style to the mix, and his songwriting helped the originals. The covers seem to have more depth and crate digging, bringing deep cuts to the fore. It’s a bit of a renaissance for the band, who were almost considered DOA when Wilko left by the wags. They had a few good years left in them, and this album points the way toward those. NOTES & MINUTIAE: Gypie Mayo’s real name was John Cawthra. GRADE: B: Decent old-time, old-fashioned rock-and-roll for the UK scene. OTHER SONGS YOU MAY KNOW: The cover some obscure blues and early rock songs. WHAT’S IT ALL ABOUT: Third studio album by the retro / roots rockers mines familiar territory, and the energy seems a bit down from their other raucous albums and live set. SOME WORDS, PHRASES AND CLAUSES ABOUT THIS RECORD: With the punk explosion big news in the UK, and those bands expressing love for the retro sounds of Dr. Feelgood, this album basically shipped out as a big hit. Their live LP went to #1 and people were anxiously awaiting this one. It’s good…I mean just good. The formula seemed a bit tired by now. The covers were obscure and tasty (one by Bo Diddley, Eddie Fontaine, Dr. John and Willie Dixon) and the title cut had some spark, but it all seemed a bit half there at times. Wilko Johnson didn’t contribute as much as he normally did. His guitar playing is still on point, but something was up and he nearly quit during the sessions. That may explain the lack of fire and original songs here. NOTES & MINUTIAE: The title cut was their first charting UK single. GRADE: B-: After the highs of their other albums, this just seems flat and kind of a downer. OTHER SONGS YOU MAY KNOW: The covered some rock and R&B classics as well as their originals (which you only know if you were in the UK at the time, really). WHAT’S IT ALL ABOUT: Live album from rootsy pub rockers / punk inspirations rockets to #1 in the UK – confirming their appetite for unadorned rock and roll. SOME WORDS, PHRASES AND CLAUSES ABOUT THIS RECORD: Someone called them the “John the Baptists” of the UK punk rock movement. Yeah, that’s about right. While it’s not punk rock – they write in a traditional rock vein – it is just guitar, bass, drum and vocal. No fancy suspended diminished seventh minor chords or fuguin’ fugues. It’s rock and roll, man. Rock and roll. After just two studio records, the Feelgood’s released this live record as their live shows were where magic happened. While you don’t get the visual of these guys sweating up a storm while performing, you do get to hear them and the crowd reactions. It’s akin to the crowd at Five Live Yardbirds. Wilko Johnson’s the star – his guitar controls the songs and the fans. They cover Chuck Berry, Rufus Thomas, Sonny Boy Williamson, the Coasters and Rufus Thomas and make them sound like their originals – which are darn good too. We here in the US only really know them if one wants to research punk rock and its UK precursors (like pub rock and glam). I do think there definitely was a niche for them here, but it’s kind of late now. Well, no it isn’t. Just take a listen. NOTES & MINUTIAE: You can’t stream it separately but it’s easy to pick out the album from their box set (all of their stuff with Wilko is there) and sequence them. I’m not adding it to Missing in Action since it’s kind of obscure AND it’s available fairly easily. Also, this was the first UK album to enter the charts at #1 during the week of its release, and it stayed there for nine weeks. IS THERE A DELUXE VERSION: They originally released a special 45 of “Riot in Cell Block #9” backed with “Johnny B. Goode” on vinyl, but only re-released it in the box set. GRADE: A: It’s a fun rock-and-roll live record. I’d recommend putting it together and giving it a listen or ten. OTHER SONGS YOU MAY KNOW: They cover a few classic old rock and blues songs. WHAT’S IT ALL ABOUT: Second album picks up where the first left off; the UK public seems more in tune with simple, good ol’ rock and roll. SOME WORDS, PHRASES AND CLAUSES ABOUT THIS RECORD: The second time around, Dr. Feelgood mines the same territory as their debut; this time, though, they have six originals and five covers. Unless you knew the originals you’d think that the covers were originals as Dr. Feelgood and especially guitarist Wilko Johnson make them their own. However, the songs are just a bit short of the debut, and the energy seems a wee bit less. It’s still a good rock-n-roll album and fun to spin. The most effective tracks are “I Can Tell” a Bo Diddley cover, and “Don’t You Just Know It” from Huey “Piano” Smith. This record, though, resonated a little more with the UK music fans, as straight up rock-and-roll was getting into vogue after several years of prog and glam. NOTES & MINUTIAE: The drummer is known as The Big Figure; his real name was John Martin. GRADE: B: It probably refreshing to hear real rock-and-roll in 1975. It’s still true today. WHAT’S IT ALL ABOUT: Pub rockers go back to the future – their love of early rock and R&B established an early bridge from pub rock to punk rock. SOME WORDS, PHRASES AND CLAUSES ABOUT THIS RECORD: One name that came up a lot when doing some history of the formation of the various punk bands was Dr. Feelgood. They played stripped down rock and roll and R&B that eschewed the fancy trappings of prog and other rock excesses and put rock-and-roll back to its basic elements. This album shows why early punks looked to them as an influence. It’s just rock-and-roll, really. Wilko’s guitar drives everything, especially on “She Does It Right”, which should be in a course for Rock-and-Roll 101. Soon, the Stranglers, the 101’ers and even the Jam took cues from them, and it was just another step or two till punk. As for the album itself, there are a couple of all-timer cuts and some that don’t quite smoke as well as the others. It’s good though, especially if you want you some rock-and-roll. NOTES & MINUTIAE: The album was recorded and released in glorious mono, and it sounds great! IS THERE A DELUXE VERSION: Yes. Live cuts and a stereo version – for why because I dunno. GRADE: B+: You’ll find several songs to like and “She Does It Right” is an all-timer!